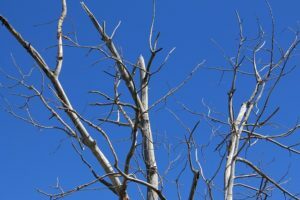 Should You Be Removing Dead Branches from Your Trees? Is it worth all that effort to trim those dead branches off of your trees? Let’s find out. The weight of winter snows and icicles is quickly approaching, and it’s important to get any tree maintenance crossed off your to-do list soon. Pruning your trees is one of the best ways to ensure that they are healthy and keep your family safe. Removing dead branches is essential before winter arrives! Dead branches are a gigantic safety hazard for your home and your family. If your trees have dead branches on them, the weight of winter snow and ice could cause them to collapse and fall on your yard, your home, or your family. Dead branch removal also gives a tree expert from Harford Tree the chance to inspect every tree on your property and identify any other problems with them, like diseases. Keep in mind that mature trees on your property can weigh a phenomenal amount (well over 5 tons). If the tree is dead or has dead branches, the entire weight of them falling on your property will do a huge amount of damage. Keeping your trees in good health is very important. While many diseases will take years to actually kill a tree, there are often many different treatments they can receive to reverse or fix the problem in the meantime. By catching problems before they turn into bigger problems, you will save money and prevent potential disasters from happening. Beautiful trees are trees that are healthy and well trimmed. If you don’t maintain the trees around your home with regular pruning and dead branch removal, your property value can be lowered. If you are planning on listing your home in the future, the cost of improperly maintained trees can actually detract from the listing price! This entry was posted on Friday, November 3rd, 2017 at 12:32 pm. Both comments and pings are currently closed.